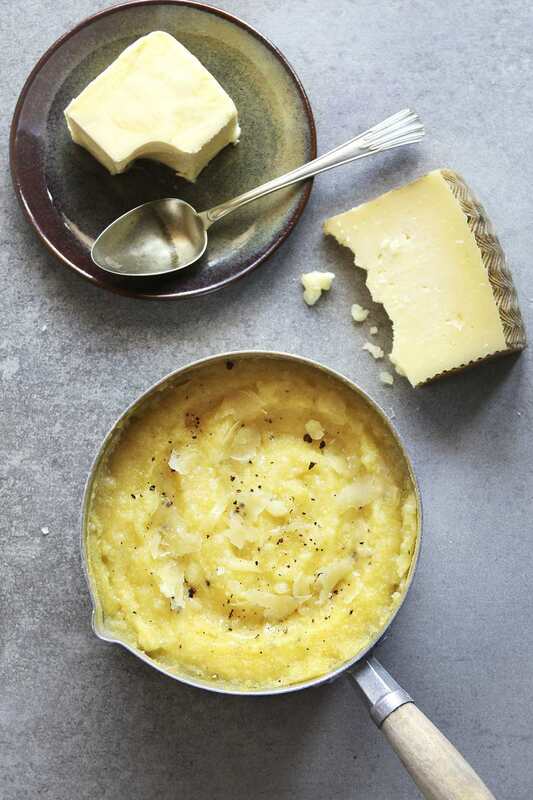 In this polenta recipe, creamy ricotta cheese adds luxurious richness without a lot of fat, while parmesan cheese gives it depth and complexity. The best pan for making polenta is a saucier, which has sloped sides and a rounded base, making it easy for a whisk or spoon to stir thoroughly. Leftovers can be made into pan-fried polenta cakes. In a saucier pan or saucepan, combine the water and milk. Bring to a simmer over medium-low heat. When it simmers, sprinkle the polenta gradually into the pot, stirring briskly with a whisk to prevent lumps from forming. Add a pinch of salt and continue simmering over medium-low heat, stirring frequently with a whisk. Cook for about 20 minutes, until the polenta does not have a gritty mouthfeel when tasted. Stir in 1/4 cup ricotta cheese and parmesan cheese and stir with a whisk or wooden spoon until the cheese is melted. While the polenta is cooking, chiffonade the basil leaves: stack the leaves and roll tightly into a cigar shape. Use a knife to cut through the roll crosswise to make thin shreds of basil. Set aside. To serve, spoon a portion of polenta (about 1/2 cup) onto each plate. Top with a dollop of about 1 tablespoon ricotta cheese and sprinkle with some of the basil chiffonade. Serve immediately.